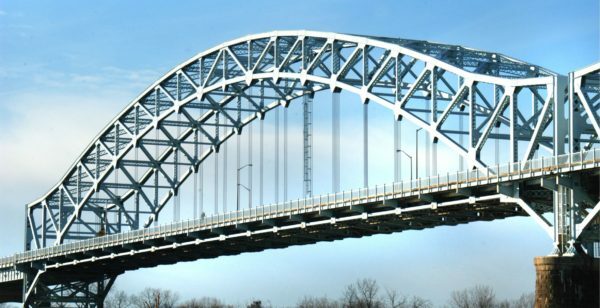 Civionic Engineering & Consulting (2014) Inc. has been contracted by Polytec Inc. to help in the analysis of the Arrigoni Bridge suspender cables. The Arrigoni Bridge is a steel through arch bridge carrying Route 66 and Route 17 across the Connecticut River, connecting Middletown, Connecticut to Portland, Connecticut. When it opened in 1938, the 1,200 feet (370 m) bridge was the most expensive bridge ever built in Connecticut, at a cost of $3.5 million. Its two distinctive 600 feet (180 m) steel arches have the longest span length of any bridge in the state. The bridge has an average daily traffic of 33,600. Laser based vibration testing equipment, provided by Polytec Inc. will be utilized under supervision of Civionic Engineering. Our advanced analysis will provide the tension forces of each cable for further analysis of the bridge. Civionic Engineering and Consulting (2014) Inc.
Civionic Engineering & Consulting 2014 Inc.